We have a secret. We’re kind of obsessed with chocolate. Okay, we know—it’s not really a secret at all. So when we strolled past a ‘learn how to make chocolate inside’ sign after our afternoon of horseback riding, we couldn’t resist the gravitational pull to find out more. 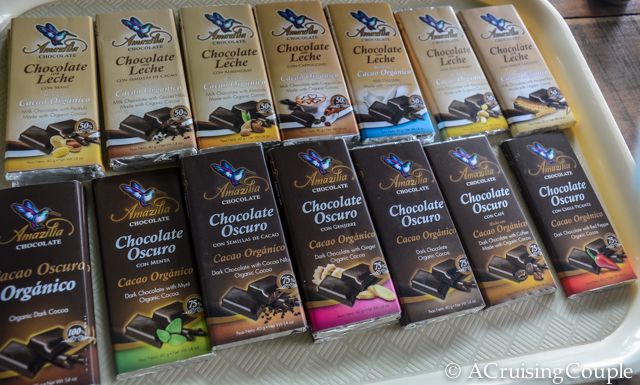 Less of a tour and more of a lesson, we learned how to make chocolate beneath an open-air pavilion, surrounded by cocoa plants, vanilla pods, palm trees, and the ubiquitous Arenal Volcano. But though we were physically present in this garden oasis, class would begin with a bit of time travel…all the way back to the days of the Mayans. 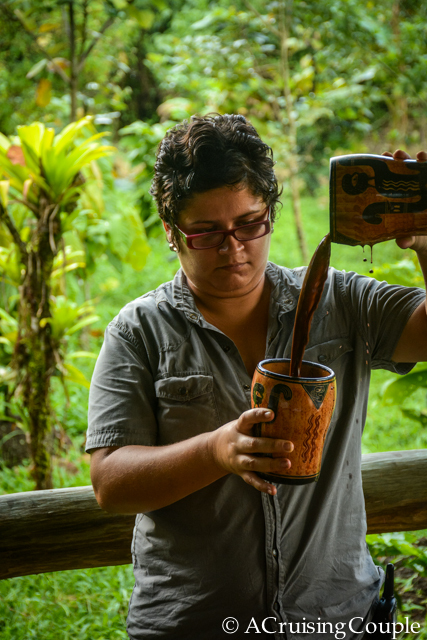 Cocoa beans have long held importance in Mesoamerica, and were actually used as a form of currency in many countries, Costa Rica included. The delight of consuming cocoa first came to us in the form of a chocolate drink. 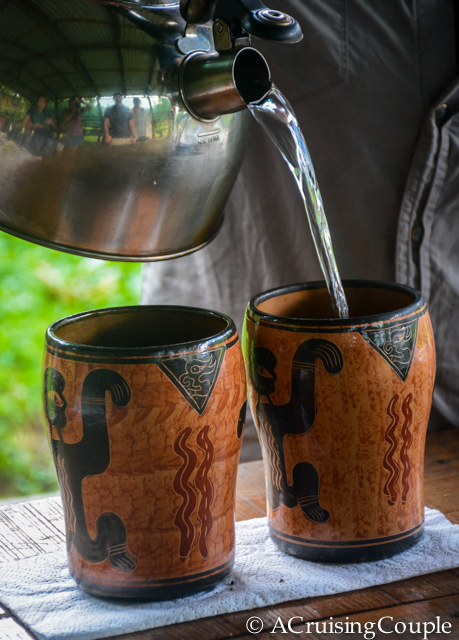 A mixture of cocoa, water, red pepper, vanilla, and other various spices, it’s said that Spanish soldiers actually took to calling the beverage ‘caca water’ (or poop water) because of its bitter taste and unappetizing appearance. 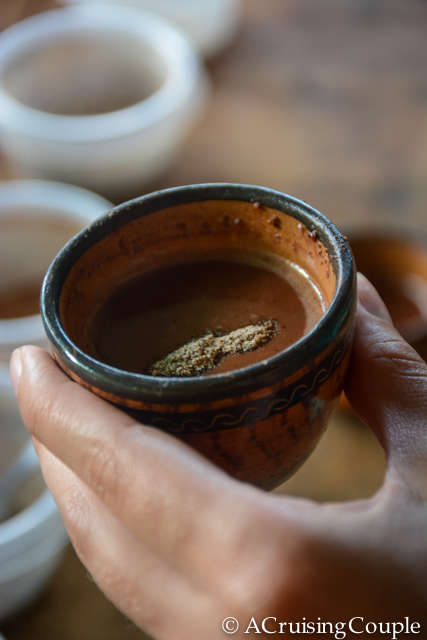 Chocolati was a favorite drink among Mayan royalty though; they might have drunk up to 60 cups of the frothed beverage each day, most likely for the mood enhancing benefits. The Spanish would later adjust the chocolate drink to European tastes, adding sugar to create the chocolate we know now. 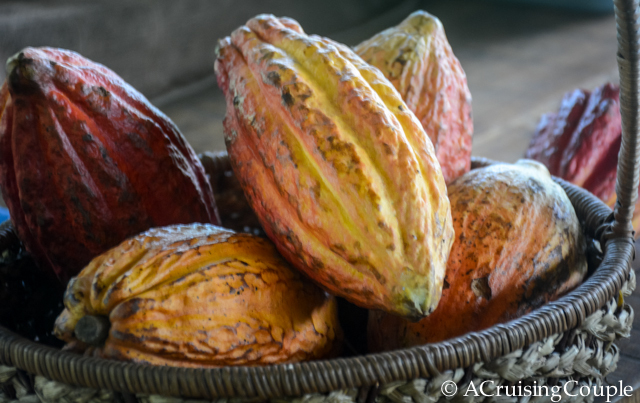 With a basic history of cocoa upon us, it was now time to learn how to make chocolate. 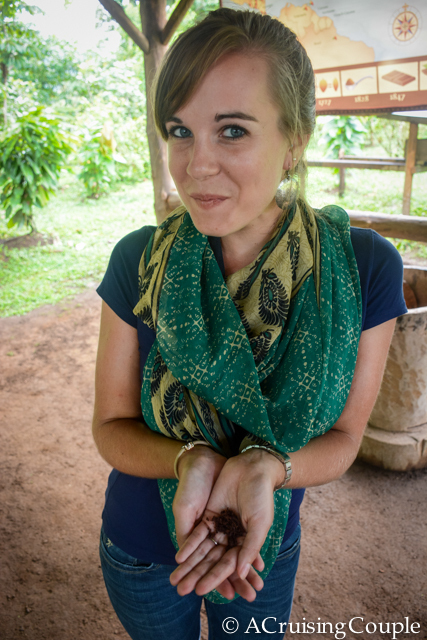 This was my first time holding a cocoa pod, and I was quite surprised by what I saw. 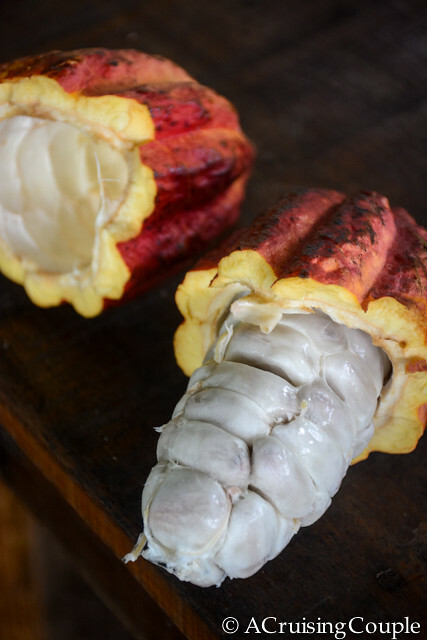 Rough, leathery and yellow, a pod can hold up to 50 large cocoa beans—though keep in mind it takes up to 400 beans to create 1 pound of chocolate! It takes a week for the beans to obtain their familiar appearance, after the sweet, white pulp has liquefied and the fermentation process finished. 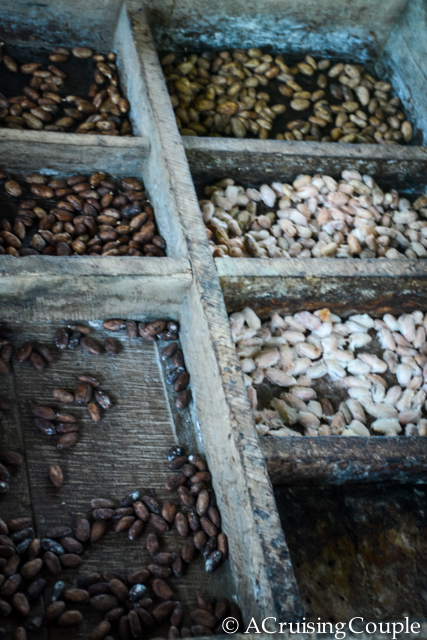 The beans are then dried in the sun for another five or so days before they are roasted to develop their flavor. 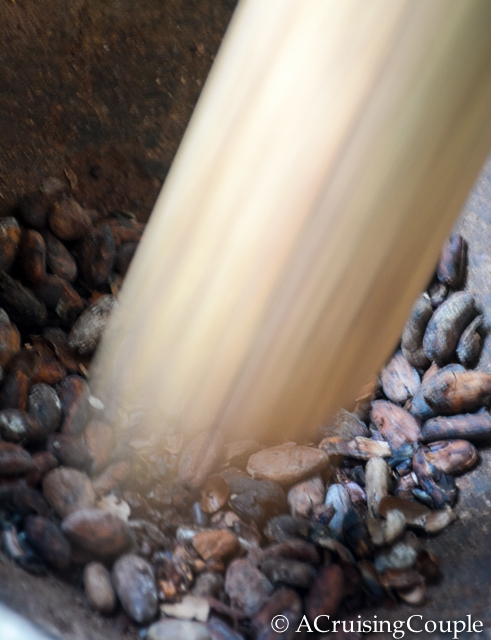 After being crushed and ground (originally by hand), the cocoa is soft and fine, ready for cooking. Now comes our favorite part of the tour—the actual eating of the chocolate! First up was a modern interpretation of the Mayan chocolati drink. Our guides showed mercy on us by adding a bit of sugar. 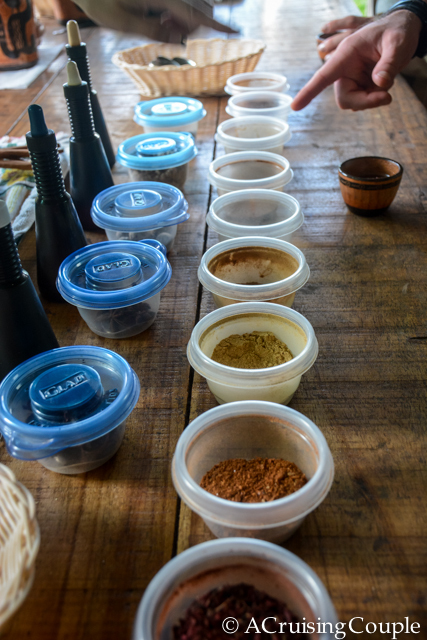 We easily gulped down two or three cups, adding different spices like vanilla, chili, and pepper, each concoction surprising and enlightening our taste buds. When we had finally had enough of drinking our chocolate, we moved on to savoring its gooey form. Still hot from the stove on which the cocoa had been boiled with water and sugar, we filled our spoons up with rich, pure melted dark chocolate. In similar form to the chocolate drink, we mixed and matched different spices. My personal favorite came from adding chocolate nibs, or pieces of cocoa, to the already melted chocolate. Did I mention we can be a bit obsessed? The chocolate concoctions kept coming until we could finally take no more. Luckily we didn’t feel guilty about our indulgence for a second—from the caffeine, phenylethylamine (love chemical), anandamide (natural high), tryptophan (serotonin), theobromine (mood elevators) and flavanoids (antioxidants), we were feeling pretty good. And with that in mind, it’s no wonder the Mayans consumed 60 mugs of cocoa a day! 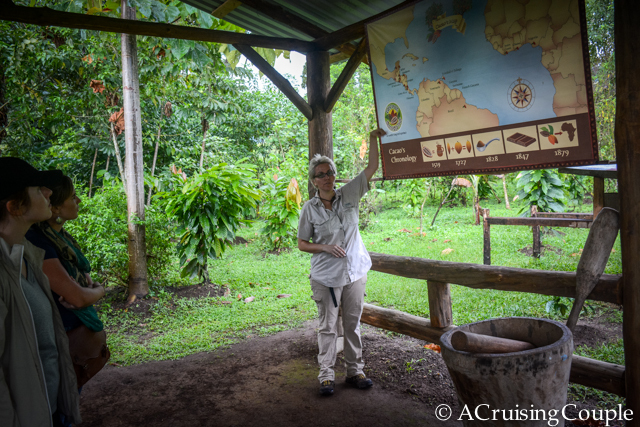 Everything about our afternoon with Rainforest Chocolate Tour was fantastic—the setting, the guide, and the chocolate… we could go on and on! 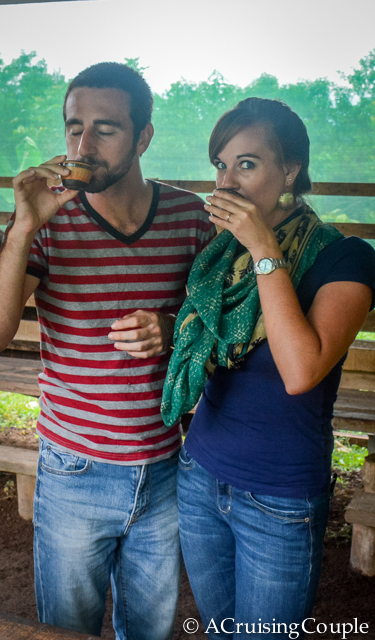 It was the perfect way to spoil ourselves while also learning about Costa Rican history and culture. 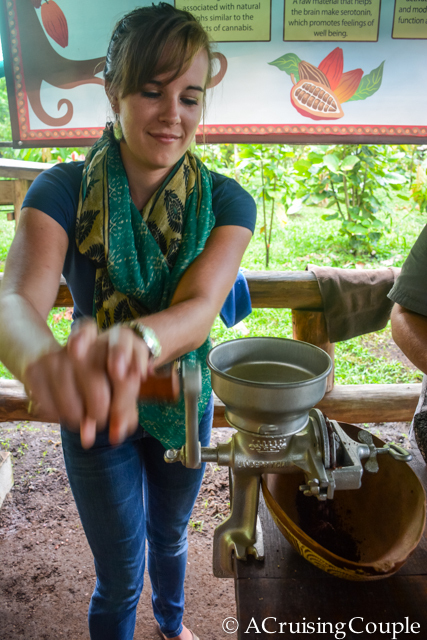 The chocolate tour is quite affordable, ringing in at only $20 per person. Just make sure you come on an empty stomach so you can enjoy all the chocolatey-goodness your heart desires! 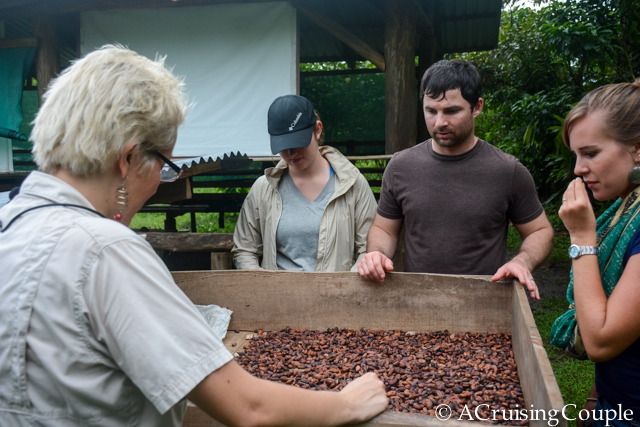 We were guests of Rainforest Chocolate Tours as part of our #yourRica blog trip. All thoughts and opinions remain our own. We hand-select the companies we work with to ensure we only bring you top-quality businesses and services. 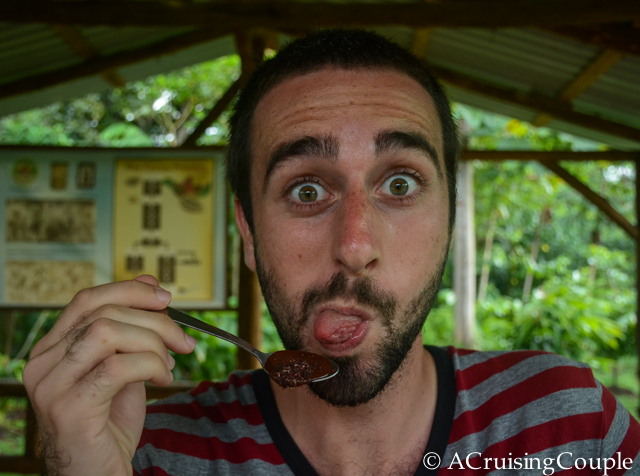 Have you ever done a chocolate tasting tour? Did you learn how to make chocolate? What’s the best chocolate you’ve ever tasted?